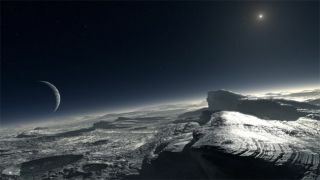 Artist’s impression of how the surface of Pluto might look. The image shows patches of pure methane on the surface. NEW YORK — Pluto's status nowadays as aso-called plutoid and former planet may be official in the latest textbooks,but someone forgot to tell the astronomers. A panel of six of them gathered here lastTuesday to debate the former ninth planet's status at the American Museum ofNatural History, along with moderator NeildeGrasse Tyson. Public interest in poor Plutohas peaked ever since the International Astronomical Union demoted Pluto fromplanet status in 2006. And it became clear at the museum event that fierce disagreementstill exists among top scientists at the leading edge of the debate. The panelists said they remained dissatisfiedwith the IAU decision, which if anything has only intensified the debate andconfused the public with politics amidst uncertainty. "The IAU vote was really a politicalaction to the Pluto huggers and Pluto haters," said Mark Sykes, directorof the Planetary Science Institute in Tucson, Ariz., who has led criticism ofthe IAU's decision. The face-off reaches back at least severalyears further. As director of the American Museum of Natural History's (AMNH)Hayden Planetarium, Tyson found himself facing an outcry from astronomers,science educators and students when the museum opened a new solar systemexhibit in 2000 that intentionally omitted Pluto as one of the planets. Tuesday evening's conversation revealed howuncertainty can breed politics in science — but also how scientists deal withan evolving understanding of the universe. Many people involved in the Pluto debate fallroughly into two camps. One side argues that Pluto, which sits far out beyondthe eight current planets, belongs with the icy Kuiper Belt Objects that ithangs out with beyond Neptune. The other side says that Pluto's characteristicsdistinguish it from lesser bodies in the solar system, and so it deserves theplanet moniker. The International Astronomical Union (IAU)first demoted Pluto to a "dwarf planet" in 2006 after the discoveryof Eris, a Kuiper Belt Object larger than Pluto. Last year the IAU went furtherby reclassifyingPluto as a plutoid, essentially ruling out Pluto's planetary status becauseit sits beyond Neptune and fails to clear out asteroids and other smallerdebris from its orbital neighborhood. Many of the astronomers and astrophysicistsat the recent debate agreed that the IAU's use of the word "clear"was confusing, because not even Jupiter completely clears its neighborhood.Instead, they suggested that Pluto does not "gravitationallydominate" its neighborhood like planets such as Earth, Jupiter or evenMercury. "Classification is meant to facilitatecommunication between scientists," said Steven Soter, a planetaryscientist at AMNH who co-hosted the "Cosmos" television series withCarl Sagan. "Now about clearing, that was an unfortunate term, becauseplanets never fully clear their orbits." But the museum panel strongly disagreed onwhether or not to include Pluto, Eris and other round Kuiper Belt Objects asplanets. Soter said that he agreed with the idea of partly defining planets bywhere they hang out in the solar system, which brought an immediate responsefrom other astronomers. "By the IAU's definition, when a cowboyherds his cattle he becomes a cow by association," said Alan Stern, aplanetary scientist and former NASA science director who was deemed "Mr.Pluto" by Tyson. "This is why I like characteristics and notassociation." Stern wondered at the absurdity of adefinition that would exclude an Earth-like object with "oceans,continents, blue sky, people and Broadway lights" if it sat beyond acertain distance in the solar system. The idea of what counts as a planet becomeseven less certain beyond Earth's solar system, where space telescopes haveuncovered more than 300 exoplanets orbiting stars other than the sun. "No one is writing a law or rule thatyou have to call them this or that," said Sara Seager, an astrophysicistat MIT. She pointed out that while most attention hasfocused on the lower limit of the planet debate with Pluto, scientists alsofiercely debate the upper limit where a planet becomes a star. A star istypically defined by being able to carry out fusion, but some super-massive browndwarfs and other objects blur current planetary definitions. "People have some cutoff they like, butlo and behold, astronomers discovered three planets orbiting a centralstar," Seager noted. "According to the IAU, they can't be planetsbecause they're too massive." And if defining a planet by itscharacteristics can run into some difficulties, defining planets by locationgets even trickier. Tyson wondered about objects known as "planemos,"or "rogue planets" that float through space without a star to orbit. "Why not have a classification schemestarting with planemos ... I don't really like that word," Tyson mused. Gibor Basri, an astrophysicist at theUniversity of California-Berkeley, chimed in. "It didn't really catchon," said Basri, who coined the term. Uncertainty aside, all of the panel membersspoke eagerly of NASA's Keplerspace telescope, which launched on March 7. That mission is designed tosearch for signs of smaller, rocky planets like Earth among over 100,000 stars. "Let me be bold and say that perhapsplanetary science is still in its infancy, and has no business classifyinganything at all yet," Tyson said, noting that new data from Kepler'ssurvey could change the debate down the road. The whole debacle has painted a new pictureof how planetary scientists operate. "I think this has been one of the moredisappointing episodes for science with regard to the IAU," Stern said. "Now school kids see science as voting, and that's not the best way to doscience." "I like to call it the IrrelevantAstronomical Union," Stern added. He summed up the messiness of thescientific process as being "like cats herding themselves." Basri agreed that "whenever you get a[scientific] issue decided by a vote, I think you can infer that people don'tknow what they're talking about." He observed that scientists did not voteon the existence of gravity. All the arguments can also hide the fact thatscientists continue to do research and pursue new knowledge, Seager suggested. "I'm not calling Alan [Stern] and saying, 'What do you think today, is ita planet?'" she said. The science may remain far from settled onPluto and other planets, but the panelists also saw a bright side in the mess. "The best thing about this debate isthat it got people interested and became a teaching moment," said JackLissauer, a theoretical physicist at NASA's Ames Research Center in California. Much of the original controversy over Pluto'sdemotion may stem from how science has been taughtin schools, Tyson said. He criticized the idea of branding facts into thebrains of young schoolchildren, given that science remains a dynamic andever-changing process. "I see this as maybe a rare moment tosee the birth of a new way of thinking about the solar system and the richnessof objects that orbit it," Tyson said. He recalled recent letters fromthird graders born in 2000 who are now "kind of OK with Pluto beingsomething other than the ninth planet," because they grew up with Pluto'splanetary status already in question. Seager mentioned that she had kids juststarting school at a time when the "whole toy industry has already droppedPluto," but also expressed confidence that students would be okay with achanging understanding of the solar system. After all, the panelists suggested, it'sperhaps more important to love the scientific process rather than thescientific facts. "I'm one of the people who don'tcharacterize Pluto as a planet," Lissauer said, drawing applause as hebrought out a Disney "Pluto" stuffed toy. "But I care aboutsolar system objects, and I am a Pluto hugger."